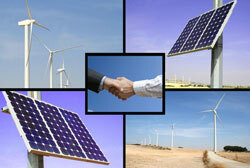 Eco Energy Applications (EEA) is a leading provider of sustainable energy projects and services. The Company provides turnkey services to develop, implement, construct and finance energy projects for utility scale power generation and building integrated renewables and sustainable technologies. The executive team and staff of EEA are comprised of highly qualified individuals with significant experience in all phases of energy, project management including: energy supply planning, procurement, contract negotiations and risk management, energy efficiency improvements, project identification, renewable project development, design, construction, installation, training, maintenance, monitoring and project financing. We hope you will think of EEA and its sustainable energy solutions and capabilities on your next project and experience the EEA team approach.